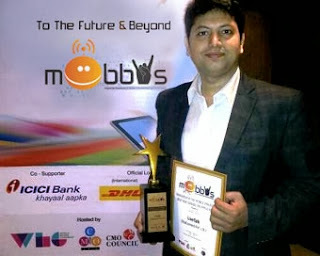 It’s a celebration time for VivaConnect as their innovative product‘LiveTalk’, wins Mobbys Award 2013 for ‘Best New Service’ in Mobile Industry. a number and listens to a Live event held in any part of the world easily over his Mobile”, says Vikram Raichura, Managing Director and the brain behind the product & company. LiveTalk was developed to allow live audio streaming of events over Mobile through a phone call for individuals who can’t make it to the event. It establishes an on-demand service without charging any cost for the facility. Of recent LiveTalk connected lakhs of callers to Shri. Narendra Modi’s speeches held at different locations across India. The product is a great medium for connecting masses with live events such as Political campaigns, Music concerts, Business conferences, Conventions, Spiritual meets, Educational lectures, etc. “We are honored to be bestowed by a Mobbys award for our product which is just a month old. Its an accolade to our teams efforts, reflecting potential of our company towards creating innovative mobility solutions. There’s more rolling out in 2014”, adds Vikram Raichura happily. VivaConnect is a Creative Mobile Marketing Company from Mumbai which has India's largest infrastructure for Voice and Missed Call Services. They ideate and execute creative mobile marketing campaigns for numerous Banks, FMCG, Media Houses, TV Channels, etc. Mobbys is an annual award hosted by World Brand Congress, CMO Asia and CMO Council, that celebrates the excellence in Mobile Entertainment and Technology with over hundred participants each year.